This anime has taken off since it has first aired as a anime. Members of different guilds go on adventures to complete quests and become stronger. Helping the guild advance and become stronger in the fairy tail world. This anime has a lot of different characters both male and female. 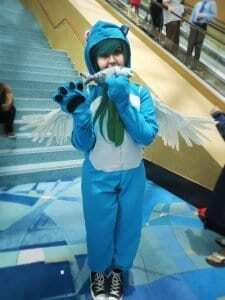 Making it so there are a lot of options for couples or friends when deciding who to go as to a anime convention. In the fairy tail guild Erza plays a important role she is a strong leading female character. Not only does she wear cool armour but goes to battle and helps out the guild in many ways. Always serious and ready for the next quest she is a powerful guild member. Every member has a fairy tail logo tattoo on them as long as they are part of the guild. You can see Erza has hers on her upper arm which can bee seen in the first 2 pictures. 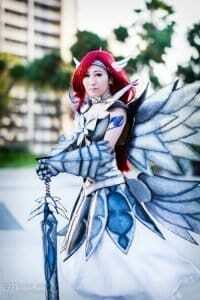 She also has many different types of armour and weapons in her collection no one knows exactly how many but its a lot. The long red hair and armour really sets off this costume. 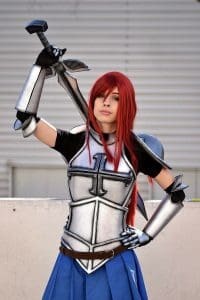 In the first picture the person has activated one of Erza’s strongest armours! 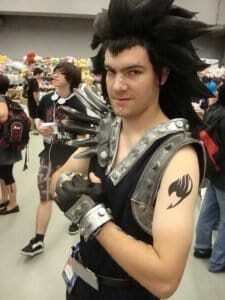 Starting off as a enemy Gajeel was quite ruthless even hurting his own allies in combat to make sure he won. 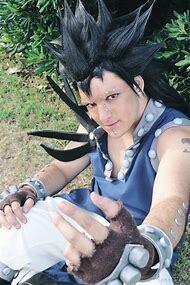 When you are doing a Gajeel cosplay the most tricky part is the hair since it is extremely long and spiky. His power allows him to manipulate iron, you may notice it sticking out from his arms and nose. A lot like Pain from naruto haha! One thing that doesn’t change and you can see that everyone has in common is the black hair. Each person has there own style to it but none the less they have it sticking up looks great. Some use the black cape with spikes coming from the right shoulder outfit. The others have a blue version with buttons around the collar and arms of the shirt. Keep in mind the black boots with iron as well as gloves with the iron bracelet. Natsu’s friends that follows him around on his adventure not only funny but cute too! With his white wings his able to help Natsu in battles with speed attacks and helping him fly. 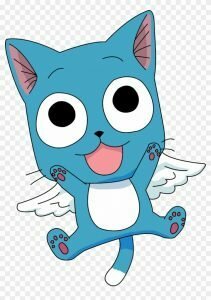 Since Happy is not human but a flying cat it makes him tricky to cosplay as. Most people go with the full costume with no open face while some have the open face. Both are fun and do the job since you can easily tell who the person is cosplaying as. 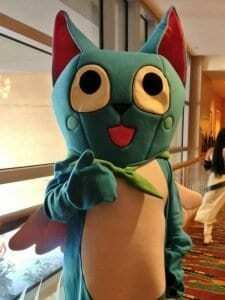 The full Happy costume can be bought at a store or online. It will come with everything you need to complete the costume! 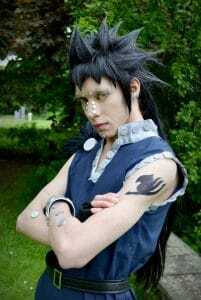 A powerful S class guild member of fairy tail as well as the grandson of the guild leader. 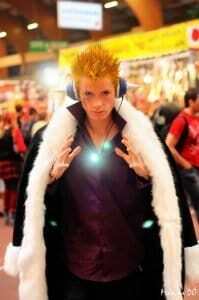 With the ability to use lighting and move at high speeds Laxus is one of the strongest members of fairy tail. He takes part in some amazing battles in the anime and a lot of guild members look up to him. 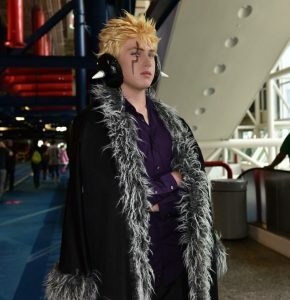 These Laxus cosplay costumes are amazing the first one has the photoshop effect. The hair looks really good and he has his head phones on which look cool since its a spike. My favorite is the middle picture of Laxus you can easily see the scar that he carries over his right eye. 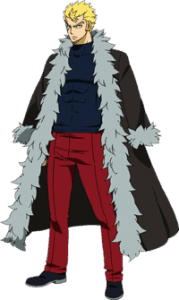 The hair and long coat match that of Laxus in the anime, not sure if that is real fur or not. The hair in the last picture could be a lot better it is like they forgot to gel it. 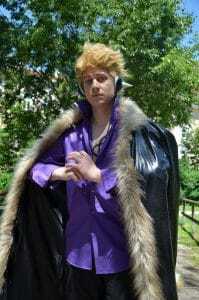 This overall cosplay costume can be made from local shops and ordering the ear piece online. The black pants and purple shirt can be bought at any local big box shop. By collecting and owning the Celestial Spirit Keys Lucy is able to summon different spirits to aid her in battle or to over come a obstacle. Each celestial spirit key when used has a different outfit for Lucy so she does have quite a few. That being said this is her normal outfit and most well known. A few really good Lucy cosplay seen above each with its own twist. The first has her holding 2 spirit keys and you can even see one hanging off her skirt. Happy sitting next to her is a nice touch and makes for a great photo. The middle Lucy is wearing a different outfit but still has the traditional blue and white colors. The last picture has her wearing the normal outfit but has the belt on and visible. This picture is cool since she has her hand up making the fairy tail tattoo visible. 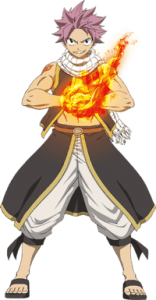 The main character of Fairy Tail Natsu controls fire dragon slayer magic he can even absorbe fire magic used on him. Throughout the anime we follow Natsu as he goes on many quests, battles and adventures. 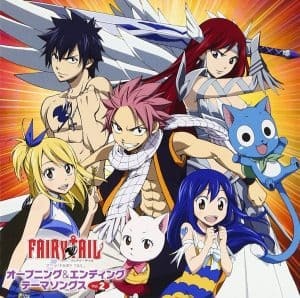 Other guild members join him like Lucy as they try to find become stronger. 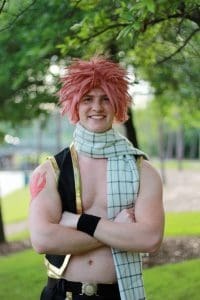 These Natsu cosplay pictures are american and japanese style. 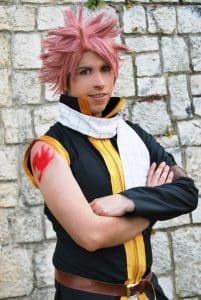 The first looks to be a japanese take on Natsu the hair looks good as well as the scarf. Taken out in the woods it really adds to the photo bringing it to life. With a brick background this Natsu cosplay has the shirt fully done up which is not how he usually is. His scarf looks the most like from the anime picture above though. The last picture shows Natsu smiling which is what he normally is like happy go lucky haha! 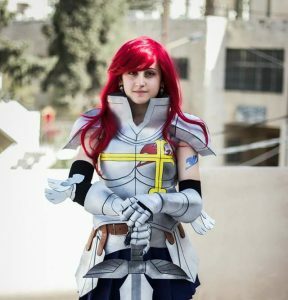 Let me know what you guys thought of these Fairy Tail Cosplay costumes. Which one is your favorite or should be added that I missed!